We deliver a solid state fluid ionizer which uses "magneto hydrodynamic frequency" (moving fluid powers the unit, no external power source). Very low maintenance, lasting performance, accelerated separation, easy to install. 2", 3", 4", 6", 8" and 10", each in low flow and high flow designs. We will match the right unit to your pipe size and flow rates to optimize results and your economics. These units perform best, and performance is easiest to benchmark on situations with consistent flow compositions and higher flow rates. We will still improve your situation, but it gets harder to prove when fluids change often in composition. Q: How do I sign up for a trial? A: Contact us at [email protected], and we will send you a site qualification form to help you identify locations on your facility where we can optimize returns. Q: Can I buy or lease? We encourage you to consider a lease because this way our performance is tied to your satisfaction, and we share some of the risk. You will also benefit from product updates as they occur. As an operating expense we should prove beneficial from an accounting perspective. Q: Once ionization occurs and the bonds between molecules are broken, how long does the ionization last? Is there a chance that later, downstream, the molecules will bond together again? A: Yes, at some point the molecules will lose their ionization and be able to bond together again, but it does not matter. By then the benefits of ionization will have already been realized. Consider the following simple oilfield application. A produced fluid stream of oil, water, and entrained solids travels through a Separation Enhancer to a separation tank, where each constituent is segregated and sent downstream through a pathway designed for its particular processing needs. At the Enhancer, electrons are stripped away and discharged into the earth and the molecules become dominantly positively charged. The ionization process affects not only the fluid stream that travels directly through the device, but also any additional fluids and solids—whether upstream or downstream—that are in continuity with the device. The advantage of ionization is that positively charged molecules lose their ability to bond together and the molecule clusters break apart. The molecules then move away from each other slightly in response to the repelling force caused by the like charges. As a result, the molecules in the fluid stream flow more freely past each other and separate more easily according to their specific gravities. The potential benefits are significant and include reduced pump pressure, better separation, increased recovery, improved oil quality, and a diminished waste stream. Of course, since nature prefers being in equilibrium, anything that is positively charged will readily accept an electron if a source is available. Besides the pipes and tanks themselves, the air is a primary electron source. Where and when individual molecules return to a neutral state depends on the specifics of the application and the particular installation site. In the oilfield, the Separation Enhancer is operated continuously so that, even given the electron sources that are present, the device strips away enough electrons to dominate the process and maintain an overall positive charge within its zone of influence. For some applications, recirculation through the device may be necessary. Inside the zone of influence is where the benefits are achieved. As molecules travel outside the zone, they will return to a neutral state eventually and regain the ability to bond together, an outcome that is both normal and expected. Again, it is the specifics of the site that dictate the extent of the zone of influence of a particular device. For reference, the farthest away from a device that an ionized fluid stream has been measured to date is about two miles. In short, any fluid stream within the zone of influence of a Separation Enhancer can experience the benefits of ionization. The key is to determine the optimum placement and operation of one or more devices based on an assessment of the on-site conditions as well as the specific application goals. Q: Does a pressure or temperature change have a major impact on the performance of the Separation Enhancer? A: The Separation Enhancer can perform well under a wide variety of pressure and temperature conditions; a change in those conditions will not have a significant impact. In fact, the device may cause such changes as a normal part of its operations. One of the benefits of ionization is that, as emulsions are broken up and deposits on the pipe surface slough off, there is less resistance to flow. As a result, the operator has the freedom to decrease the pressure, increase the flow rate, or do some combination of the two. This flexibility is useful, for example, at disposal sites where operators would like to increase the flow rate but must operate within whatever limit has been placed upon the allowable injection pressure. Ionization is also beneficial for sites at which the operator is trying to heat the fluid stream. Unlike plain water, the fluid stream can contain thermal barriers like entrained air, oil, and contaminants that act as heat sinks. Once the fluid stream is ionized and separated, the increased homogeneity of the constituents results in a more uniform transfer of heat. Like all mechanical devices, however, the Separation Enhancer does have some operational temperature and pressure limits. The maximum temperature is 150°F. The maximum pressure depends on the pressure rating of the flanges, which for standard units is 150 psi. Customized flanges with higher pressure ratings can be used to ensure that the Separation Enhancer can handle whatever pressure already exists in the piping on site. Q: Does the Separation Enhancer improve the API gravity of oil? A: Yes, API gravity of the oil separated with the help of the Separation Enhancer is better than the API gravity without the device. The API gravity is inversely related to the oil's specific gravity such that a higher API gravity indicates a lighter crude. Because of ionization, the separation process encourages the various constituents in the tank to segregate more completely under the force of gravity. With significantly fewer impurities, the resulting oil fraction has a lower specific gravity, which translates into a higher API gravity. Q: Does the Separation Enhancer improve oil transportation through pipelines? A: Yes, the Separation Enhancer can improve oil transportation through pipelines in a number of ways. If a Separation Enhancer is installed to improve separation prior to the pipeline, then the resulting oil slurry sent to the pipeline will be lighter with fewer impurities making it flow easier. This benefit remains even if the pipeline is partially or completely outside the zone of influence of the device and the slurry loses its ionization. Additional benefits are possible if one or more Separation Enhancers are used to maintain ionization within the pipeline. In the absence of ionization, molecules move in bound clusters forming emulsions. Friction with the pipeline wall affects not only the layer flowing next to the wall, but also some adjacent layers. With ionization, the molecular bonds break, there is less resistance to flow, and the boundary effects due to friction are more limited to the layer contacting the wall. Another benefit that enhances flow is the cleanup effect typically experienced within weeks to a few months of ionization. In many sites, scale and/or paraffin in pipelines and other equipment can build up on the walls and restrict flow. However, within the zone of influence of each Separation Enhancer, the ionization extends to more than just the fluid stream that travels through the device; the fluids and solids in continuity with the device also become ionized. Eventually, the ionization begins to affect the scale and/or paraffin, which causes the buildup to start sloughing off as the molecular bonds break. Once the pipeline completes the clean-up phase, continued ionization prevents any further buildup from restricting flow. Q: Does the Separation Enhancer eliminate the use of additives such as sand inhibitors, emulsion breakers, flocculation agents, and methanol injection? If not, how much would the Separation Enhancer contribute to downsizing the use of those chemicals? A: The Separation Enhancer can significantly reduce the need for chemical additives, but how much of a reduction, or whether in some cases the need can be eliminated, depends on the site characteristics and the goals the operator is trying to achieve. Additives are considered for use when a fluid stream poses one or more challenges in terms of flow, separation, or both. While each type of additive is designed to address a specific challenge, ionization can be used to enhance treatment regardless of which challenges are present because it takes advantage of the fundamental forces related to the positive and negative charges found in all fluid streams. The fluid streams in question are often a mixture of oil, water, solids, and sometimes gas. The molecules travel in fairly large, bound clusters with the dominant constituent—water or oil—trapping the other molecules within the cluster. The Separation Enhancer works by stripping off electrons so that the affected molecules become positively charged and the bonds between them break. More than that, because the molecules are alike in charge, they repel each other. So the more complete the ionization, the more the clusters break apart freeing the various molecules to move more independently. The different constituents can then separate more easily according to their specific gravities. An otherwise complex treatment process can often be simplified with ionization. Even if the decision is made to use a combination of one or more additives plus ionization, there will be less chemical needed with less of the associated cost, maintenance, and environmental oversight. In addition, ionization can eliminate some uncertainty for the operator, who must choose which additive strategy to pursue when the charge may vary considerably across the fluid stream. Choices must be made based on bulk properties, even though there will be some pockets for which the choices are not appropriate. Moreover, the fluid stream quality at the inlet of the treatment zone can change with time, so a choice that worked well initially may not work as well later on. With the Separation Enhancer, the fluid stream becomes cationic, making it more homogeneous and predictable than before—a much easier situation for the operator to handle. Similarly, ionization makes the product quality downstream more consistent, allowing operators to more easily make commitments to the buyers. Q: Does the Separation Enhancer help to prevent the formation of foam or act as an antifoaming device? A: Yes, the Separation Enhancer can help to prevent the formation of foam or act as an antifoaming device. Foam develops as dissolved gas comes out of solution and becomes trapped in bubbles surrounded by a liquid film rather than separating completely into a gas phase. The foam's stability depends in part on the surface tension of the liquid. The lower the surface tension, the less stable the foam is. Ionization reduces the surface tension of liquids, as evidenced by the fact that ionized water in a glass tube does not form a meniscus. As always, the effectiveness of the Separation Enhancer hinges on its fundamental behavior in ionizing the fluid stream. The device positively charges the molecules, which not only breaks the bonds between them, but also causes them to repel each other because they are of like charge. During the separation process, the unbound molecules can move more freely and segregate according to their specific gravity. As the gas molecules travel upwards and reach the boundary between phases, they can more easily break free of the liquid phase, thereby discouraging the formation of a stable foam. Q: Can the Separation Enhancer reduce the amount of time needed in a gunbarrel tank system? If so, by how much? A: Yes, the Separation Enhancer can significantly reduce the amount of time needed in the gun barrel. The amount of the reduction depends on the conditions at the particular site. Improved separation is one of the primary benefits of the Separation Enhancer. 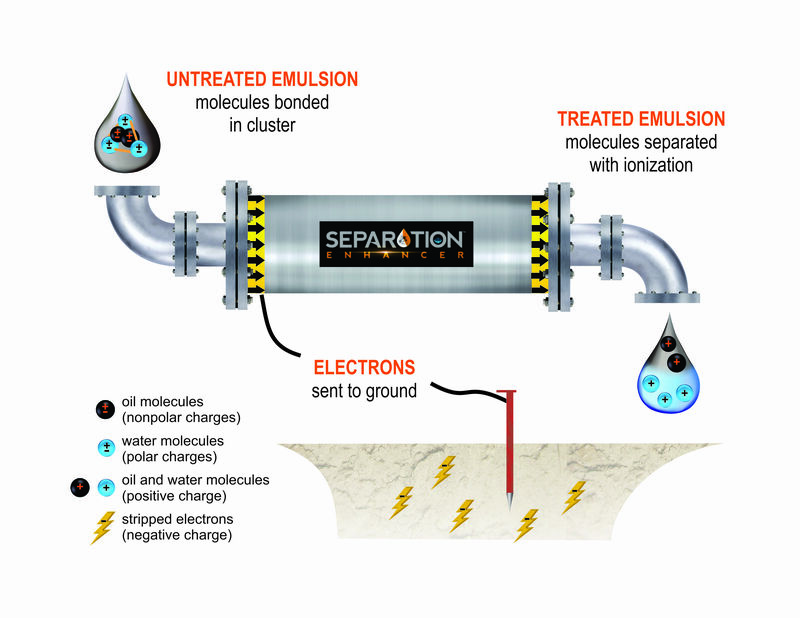 Without ionization, emulsions can trap and entrain a variety of molecules. The forces binding the molecules together can impede or prevent the gravity segregation process leading to long retention times and incomplete separation. 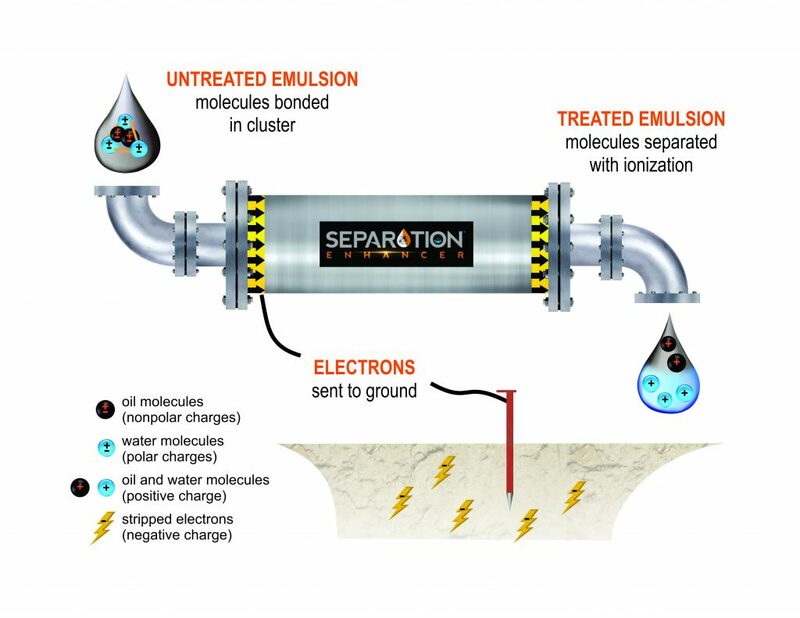 Ionization causes the emulsions to break apart, the result being improved stratification according to specific gravity and reduced retention time. Because the amount of the reduction in retention time varies with the particular site, definitive performance predictions are difficult. Some sites may experience a modest improvement while at other sites the results may be quite pronounced. As an example of the latter, an oil production site with 21 wells required 8 days to remove enough water so that the oil could be sold. Within a day of installing a Separation Enhancer, the processing time was cut to 8 hours. Another example is a salt water disposal facility processing 3,000 bbl of water per day. About 4 weeks of processing was needed to recover the entrained oil and reduce the BS&W content enough to sell the oil. After using a Separation Enhancer for 60 days, the BS&W content went from 2.5% or above to 0.4%, and the processing time was cut in half, from 4 to 2 weeks. In short, the facility was able to recover a greater volume of a higher quality, more valuable oil in less time for reduced cost. Q: If the Separation Enhancer is used to improve separation in a gunbarrel tank, does a significant amount of oil remain trapped in the grit or sand at the bottom? Does the grit or sand need to go through a secondary treatment or recovery before being discharged? A: With the Separation Enhancer, the separation process is quite efficient at removing oil from the grit or sand at the bottom of the gun barrel. As a result, no secondary treatment or recovery is necessary when the Separation Enhancer is being used. The separation process uses gravity to separate various constituents of the fluid stream, but this force can be overwhelmed by the bonds holding clusters of molecules together. As a result, oil gets trapped not only in the water layer, but also in the sludge layer at the bottom of the gun barrel. Because the Separation Enhancer positively charges molecules, the bonds holding clusters together break and the molecules repel each other. Without having to overcome the molecular bonds, gravity can more easily separate the various constituents according to their specific gravities. The process is efficient enough at releasing oil from the grit or sand that there is no need for secondary treatment or recovery. Of course, achieving the desired results depends on installing and operating the Separation Enhancer in a manner appropriate for the specific conditions on site. Obtaining only partial ionization will clearly interfere with the gravity segregation process. At some sites, recirculation through the device may be required to ensure that the gun barrel contents remain ionized. Q: Does the Separation Enhancer help to prevent pipeline and equipment corrosion? If so, please explain. A: Yes, the Separation Enhancer can help to prevent several different types of corrosion that attack the surfaces of pipelines and other equipment. Catalytic reactions, which involve an exchange of electrons, can create dissimilar charges between materials, the result being a static discharge capable of pitting metal surfaces. With the Separation Enhancer, electrons are being stripped from the system and sent to ground, thereby preventing the charge buildup needed for a static discharge to occur. A type of corrosion, called microbial-induced corrosion, is caused by the metabolic activity of various microorganisms. In the oilfield, there is often a concern with sulfate-reducing bacteria that produce sulfides. The Separation Enhancer kills these bacteria because the ionization interferes with their basic cell functions. Another form of corrosion is abrasion of the fluid stream against a metal surface, which can cause mechanical wear over time. However, if the fluid stream and the surface are both positively charged by the Separation Enhancer, the repelling forces don't allow as close a contact. Also, since the molecules are unbound rather than in large clusters, there is less volume involved, which also decreases abrasion. Another factor is that the lower operating pressures available with the Separation Enhancer translate into less mechanical strain on pumps and pipelines. In addition, the cleanup of scale and/or paraffin and the prevention of future buildup also help to prevent pitting corrosion. Q: How many Separation Enhancers per well do you suggest should be installed? Where? A: The question assumes that there are multiple wells feeding into a gathering system. In this case, it is suggested that one Separation Enhancer be installed at each well provided the minimum flow rate requirement of 20 gal/min can be met. This minimum flow rate corresponds to the smallest Separation Enhancer in the product line. Having one Separation Enhancer per well provides the flexibility of a modular approach that is independent of what is happening at the manifold. While a device can be installed by the manifold, it would be subject to flow rates that can vary significantly as the rates from different wells change. The device would be oversized to deal with the high end of the expected combined flow rates so as not to become a bottleneck during those times. In contrast, it is more efficient to install smaller devices, sized appropriately, at each well. In addition, placing a Separation Enhancer near the well means that the zone of influence may be extended down the wellbore and into the formation. Benefits can include scale and/or paraffin clean up and prevention in the wellbore, destruction of corrosion-causing bacteria, improved flow characteristics in the formation and the wellbore, and less residual oil left trapped in the formation. If a site has wells that produce less than the minimum flow rate, then installation closer to the manifold may be needed. Depending on the configuration at the site, recirculation from a tank may also be an option to increase flow and ensure the requirement is met. Q: How close to the wellhead does the Separation Enhancer need to be installed? Is the Separation Enhancer as effective when installed vertically as it is when installed horizontally? A: No single answer is correct for the first question. The optimum placement of the Separation Enhancer depends on the conditions on site and the benefits the operator wants to achieve. The caveat is that, wherever the device is installed, the minimum flow rate requirement of 20 gal/min must be met. If the main goal is to improve separation, then a Separation Enhancer needs to be close enough to the separation tank to ensure full ionization of the contents. At a disposal site, the goal is often to get the maximum flow rate while staying at or below the allowable injection pressure. In this case, the device would be installed close to the well head. The device would also be installed close to the well head of a producing well if the goal is to maximize the benefits of ionization upstream in the wellbore and formation. Among the potential benefits are improved flow rate and pressure regime, cleanup and prevention of scale and paraffin, destruction of corrosion-causing bacteria, and less residual oil in the formation leading to improved water-oil ratios. At some sites, multiple goals may mean that a decision must be made as to whether one device is sufficient or multiple devices are needed. For example, a disposal site may also do some processing to remove additional oil before disposal of the remaining fluids. If the desire is to use ionization to enhance the processing but the location is too far away from the disposal well, then a separate device may be needed specifically for the processing. A production site with multiple wells may have a device near each of the well heads so the downhole benefits can be realized. However, there may also be a gathering system with a separation tank downstream. Again, if the separation tank is too far away, a dedicated device for the separation process may be needed. Suppose the operator would like to use one device to get the benefits of ionization both upstream in the wellbore and formation and downstream where the separation occurs. Obviously, the farther away from the well head the device is installed, the less the zone of influence reaches out into the formation. Then the question arises: How far away from the well head can the device be placed and still realize some benefit downhole and in the formation? Again, the answer depends on the conditions on site, but there have been installations within about a 1000 meters of the well head that have provided benefit both downhole and downstream. Note that there is more flexibility in choosing the installation location when dealing with a natural gas well because natural gas is more conductive than oil. The more conductive the fluid stream is, the farther away the Separation Enhancer can be while still delivering the desired benefits. For the second question about using a vertical versus horizontal installation, the preferred orientation of the Separation Enhancer is horizontal. The actual orientation of the device does not affect the fundamental processes involved with ionization. Instead, the preference for a horizontal installation comes from structural loading considerations. With no moving parts, the Separation Enhancer has been designed to minimize mechanical wear and maximize time in service when installed horizontally. In a vertical installation, however, the equipment and fluid stream above the device cause some additional loading on the device corresponding to the particulars of that installation. Thus, a vertically installed device experiences wear and tear, especially on the inlet side, beyond that which occurs given a horizontal installation. Q: Is there any collateral effect on the ionized oil about which we should know? Does the ionized oil or water affect electric or electronic measuring instruments? A: There is no negative effect of ionization on the oil. However, any measurements that depend on the electrical properties of the fluid stream will be affected while the oil is still ionized. For example, an endline anode/cathode device that has a charge moving from one end to the other will be affected. The fact that such measurements will be affected is not a bad thing. It simply means that the instruments will respond to the physical situation that exists at the time. The challenge is to determine what information is truly desired and then decide what test methodology is needed to get that information. For example, because the oil will eventually recharge, someone may want to know what a measurement would be once the recharge occurs. One option is to allow the oil to recharge and take the measurement. Alternatively, it might be possible to estimate what the measurement would be by calibrating the measurement device to account for the ionized state. Of course, the discussion above assumes that only the ionized oil is being considered. Oil from the same site separated without the benefit of ionization would have more contaminants making it more heterogeneous and less conductive. Someone comparing this oil to the ionized oil or to the ionized oil after recharge would have different considerations driving the test strategy. As always, good test design depends on careful consideration of the fundamental physical situation, asking the right questions, and determining how best to use the tools available. Q: Can the Separation Enhancer also be used to promote separation in natural gas? A: Yes, the Separation Enhancer can be used to promote separation in natural gas. This question assumes a well producing some combination of natural gas and water. A dry gas well has no need for separation. A well producing oil, natural gas, and water needs separation, but the oil tends to be the driver for decision making because of its greater economic value. One of the challenges of dealing with natural gas rather than oil is that of building an understanding of when and where dissolved gas will come out of solution. At any particular point in the system, natural gas may exist as free gas, gas bubbles entrained in water, dissolved gas, or some combination thereof depending on the gas composition and the local pressure and temperature conditions. Since fluid moves along a pressure gradient, the fluid stream experiences a pressure drop as it moves from the formation, up through the wellbore, and into the surface lines and equipment. The dissolved gas may start coming out of solution anywhere along the way, again depending on the local conditions. To develop the best production strategy, the operator must study the characteristics of the particular site. For a separation tank at a natural gas site, ionization works much the same as it would when dealing with oil. The Separation Enhancer breaks the bonds between molecules and the clusters fall apart as the positively charged molecules begin to repel each other. As a result, the molecules are able to move much more freely past each other during the settling process. The natural gas comes out of solution easier and forms bubbles. The new bubbles, along with any bubbles that already existed, can travel more easily upwards through the water layer to the gas layer. The increased ease of movement discourages the formation of a stable foam at the boundary between water and gas. Meanwhile, solids can drop more freely to the bottom of the tank. Ionization also kills corrosion-causing bacteria, removes scale, and prevents future scale buildup. While there are certainly benefits to using ionization at the separation tank, there are also benefits to be realized at the well head. Within the wellbore and the surface equipment around the well head, problems with foam, bacteria, and scale are unlikely. Gas bubbles in the formation and the wellbore can move more easily. Depending on the pressure conditions, more gas may come out of solution. As a result, it may be possible to improve the water-gas ratio and increase the amount of gas produced. If ionization benefits are desired at the well head and the separation tank, the Separation Enhancer can be installed between the two as long as both remain within the zone of influence of the device. Fortunately, that zone of influence is greater for natural gas wells than oil wells because natural gas is more conductive. Therefore, there is more flexibility in determining the optimum installation location. Q: What is the effect of the Separation Enhancer on cathodic protection? A: The Separation Enhancer does not affect the ability of cathodic protection technology to guard against pitting caused by static discharge. The Separation Enhancer is isolated electrically while installed in line with a dedicated ground. Wiring could be put in place to maintain total continuity if desired. In addition, the Separation Enhancer discourages the conditions that could lead to static discharge. Static discharge occurs when a charge buildup overcomes resistance and discharges towards lower potential. Since the device strips off electrons and sends them to ground, nothing is being reduced. The fluid stream becomes an area of significantly lower potential, and there is no charge buildup that could lead to discharge.